A proposal for a 60 hectare business park adjacent to Narellan Road is gathering momentum with the first stage set to go on public exhibition. If all goes to plan, the precinct would be about a third of the size of Bella Vista’s Norwest business park and would take in the Maryfields site to the north of the Narellan Road and portions of land surrounding the University of Western Sydney and TAFE campuses to the south of the the road. 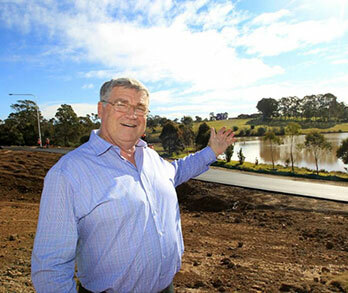 Land near Farrow Road – owned by Campbelltown Council – has also been earmarked. Council has given it’s initial support for the development of the Maryfields site (stage one) slated to be named the Nexus Business Park, however no formal plans have been submitted for the remaining areas. The applicant — Capital Syndications — does not own land aside from the Maryfields site, however a plan for the entire precinct has been been developed. Campbelltown mayor Paul Lake said the the business park would create much needed jobs to accommodate the predicted population growth of the Macarthur area. ‘‘With the growth of the region you are going from about 225,000 now in Campbelltown, Camden and Wollondilly, to well over 550,000 by 2035,’’ he said. ‘‘A business park is needed to accommodate the residents so they can work in the area. ‘‘This is a first — it’s not an industrial area, it’s an upmarket centre for businesses. Unlike the Norwest precinct which has been dogged by a lack of infrastructure, the Nexus Business Park would located next to an existing railway line within close proximity to Campbelltown and Macarthur stations. Expansions of the log-jammed Narellan Road — already underway — plus upgrades to Badgally Road and the construction of the Spring Farm Link Road are expected to alleviate any pressure from increased traffic. There will also be no need to create man-made bodies of water and topography like in the Norwest, with that already in place. ‘‘It will be completely different to Norwest,’’ Cr Lake said. ‘‘It’s good to see somewhere like the Norwest do its thing first so we can understand the problems. Cr Lake also stressed the business park would be situated around the TAFE and university, while the stations of the cross would be relocated but remain at the Maryfields site. ‘‘The TAFE isn’t going anywhere — it’s all staying put,’’ he said.